My end of the week trade idea managed to produce a few pips for my account, but because I had to take off early for the weekend, I wasn’t able to update my blog until today. It looks like that saved me a few pips as well. As we can see in the chart above, I did get just enough of a pull back to hit my entry orders at 1.4020, but not 1.4000, before the pair resumed its uptrend. My first profit target was hit just before the release of the US retail sales number, which came out better than expected. With retail sales looming in minutes, and because I had to dash off to another wedding weekend (my 12th for the year), I decided to close out at my first profit target (1.4110) and close my open orders at 1.4000. As much as I am worn out on weddings, it saved me a few pips this time as retail sales came out better than expected and provided another reason for USD bears to take profits into the weekend! It looks like the Greenback is fighting back at the start of this week, and with volatility looking up at the moment, it shouldn’t be too difficult to find a good trade setup. Stay tuned! 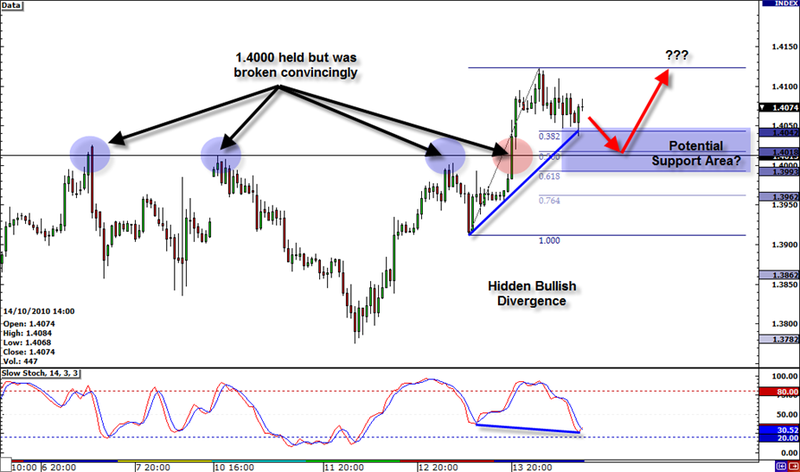 EURUSD finally breaks the major psychological area of 1.4000 as another potential round of hidden bullish divergence on the chart as the pair makes “higher lows” in price as the stochastics makes lower “lows.” Also, I used the Fibonacci tool to find potential entry levels, and the 50% Fib retracement lines up with the broken resistance/major psychological level of 1.4000. Great area for potential support. Fundamentally, we got weak US data today as Initial Claims logged in a jump up to 462k jobless claims this week. Also, PPI ex food and energy came inline, suggesting a weak demand for goods. On the European front, Germany is projected to grow 3.5% in 2010 and 2% in 2011 on surging exports. Couple this with the driving theme of further QE from the Fed, this puts pressure on the Greenback in the short term. We do have inflation data from the EU on the Forex calendar for Friday, as well as retail sales and CPI data from the US. Hopefully, this will bring enough volatility to get my entries. If I don’t get triggered before the end of the weekend, I will remove my orders and reassess, and possibly turn them back on for next Monday. Stay tuned and thanks for checking out my blog!